Your financial gift elevates the lives of people challenged by Sickle Cell. It helps build communities by allowing for Sickle Cell events, information sessions, conferences, support groups and publications to educate and connect those struggling with this disorder. In loving memory of Andrea Ndukwu, Beverly Ndukwu's little sister. 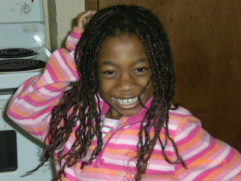 Died at age 7 of Sickle Cell related complications. A light shining bright in the sky. You can give a gift in honour or memory of a loved one. When you donate add the contact information and details where it says "add special instructions" and we will send an acknowledgment card to the person or family member of the person you’re making the donation in honour of. We are an official registered charity and give tax receipts. The Sickle Cell Association of BC appreciates your contribution. Thank you. Give monthly and you will make a difference throughout the year. You can also help support the Sickle Cell Association of BC by becoming a member.